I wrote an article for the german edition of Make: Magazin (so yes, it's only in german language) about the upcoming ESP32. 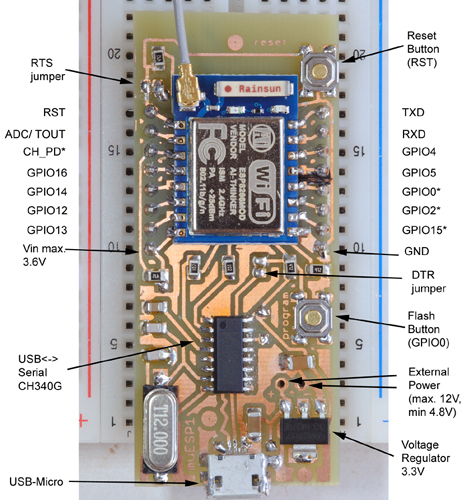 It's about the differences to its "little brother" ESP8266. 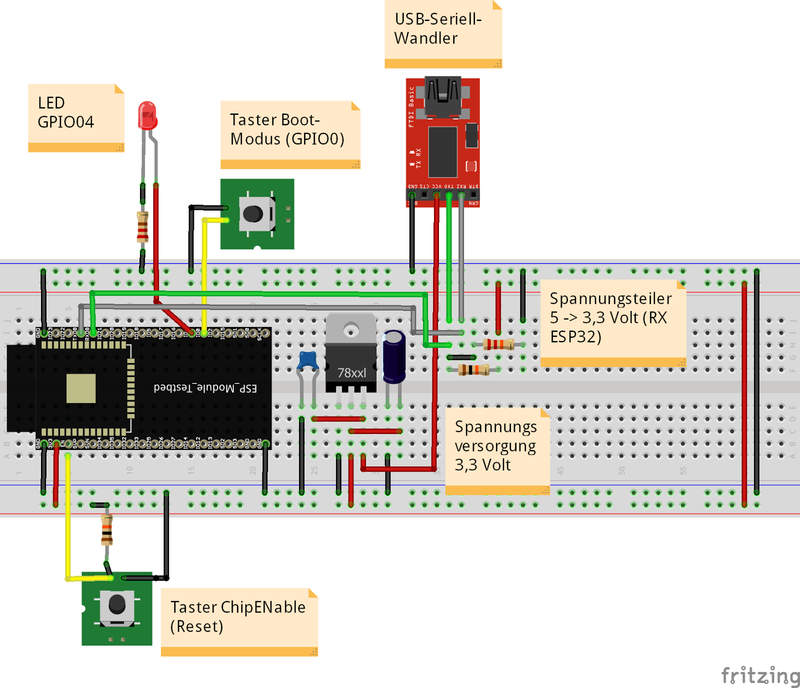 I'm also explaning how to install and work with both the Arduino IDE and Eclipse giving some basic programming examples. The ESP32 will be available in August/ September according to Espressif. Looks like we might have to wait for developer boards a few months more. 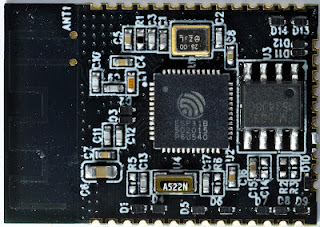 I'm currently evaluating the ESP31B developer board (ESP-WROOM-03) I got from Espressif more in depth and began to write some example code for the new chip ESP32,which is due in August/ September according to the chip manufacturer. You can find the code in my github account here. It's work in progress and I will add more code over time. I posted some high-resolution photos in this blog entry. Working for years on making "things" communicate with "machines" and hence putting them in the augmented live of ourselves there is always the discomfort of the consequences of one's actions. I wouldn't dive any deeper into any horror scenario resulting of this or serve a model for another (american) dystopian movie. Let us instead analyse hard facts in form of ONE single data stream only being available as a graph so that you can judge yourself what could be a realistic outcome of the "Internet of Things" where already billions and billions of devices are connected worldwide. 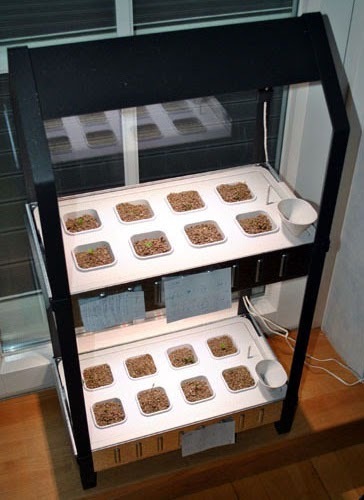 As you can read in my blog I'm currently tinkering with the new IKEA Krydda indoor gardening stuff. Nature should be allowed to run its course? Sure, but adding electronics always makes fun and often gives much more insight to things you didn't see before (did you ever take a thermal picture of something? See examples here). I'm putting the data into the "Internet of things" here so you can see 24/7/365 what's happening in my gardening paradise at home. So let's see what we can tell just from one and only one graph ("data stream"). For the beginning we assume we even have no absolute numbers like YOU do it everyday 24/7/365 with your smartphone, PC, car etc. sending your life ("numbers") to the big data centers in Silicon Valley and everywhere in the world analyzed by the smartest algorithm programmers available and fastest electronic brains existing. Nothing happening and therefore not interesting while there is nothing to see in the graph aka as a "flatline"? Wrong! Nothing happening could mean you are sleeping (now "they" can tell your sleeping habits if there are more time periods to sample) or find out that the apartment is not occupied (welcome burglars!). I do not even need to know the type of data (like temperature or electric power consumption). There is something ramping up for a certain amount of time in a very constant way. First guess: Might be a (electronic) device not a human action. Maybe the heating system? Without knowing the data type (8) it's hard to tell. But if I only know once what type of device this kind of ramping-up produces, I could draw conclusions to every other data stream from anyone I get with the same pattern. In this case it's the wake-up mode of a Philips Hue lamp over a time frame of thirty minutes (7). Linked to number (6) you might even tell the lamp type or color. Hackers welcome if they know which devices are in your home! And your next ads in your browser/ app might be related to the lamps. You also need a light strip from Philips? The previous phase is completed. Might there be something happening next or what? Compare 1, 2 and 3 over more periods and you already get very interesting details on sleeping and living habits and hence patterns. Something gets elevated very quickly like a 0 to 1 transition. Knowing the type of data (8) it's not hard to judge what happened. More insight into your living habits if linked to (7) time and date. Just from one (mechanical) action. Imagine all the mechanical switches are replaced with "intelligent" ones. Something "irregular" is happening. Typical analog data of very fine granularity and therefore very helpful. Put the data in the big electronic brains and compare it to typical analog data (e.g. weather data like temperature, wind, cloudiness) and there will be a meaningful outcome - for sure. If you have the data type (6, "light intensity"), (7, "time"), (8, "light") you do a favor to the wallets of the big data center owners because they only need to buy little computing time. Now "they" not only know your sleeping habits, living pattern, your electronic devices but also where you live. No they did not need your GPS signal you are always sending with your smartphone or the WiFi data you are allowing them to track. We are still not talking data streams with exact (absolute) numbers but only a single graph we get over time. Add goodies like a scale or reference to make it easier. But be assured clever algorithms are already bored if you give them such kind of a cheat sheet. Oh "they" also know what kind of data you are delivering - thank you for willingly helping to get the graph-only data even more interpretable. You are adding more linked data like temperature, humidity and a data stream with numbers? You are already toast, this only adds to the finer granularity of your being. And always remember: you still have not told someone one single (unencrypted) letter - like you do everyday putting your most intimate details on messengers like "Whatsapp" or by sending your data into the "cloud". We only examined ONE very simple data stream in form of a graph. Only from the pattern of one simple, single data source you can tell a lot of stuff. Much more then mentioned above - we only scratched the surface in interpreting data. That's why educating people as "Data Scientists" exploded in recent years. Now imagine ALL the data YOU (and of course ME!) are sending every second into the enormous data cloud! Judge yourself what could happen and what we should do in the future regarding data aka the "Internet of Things". For the moment OTHER people are getting YOUR data and earning a lot of money from it or even worse. What we should do and behave? Proposals very welcome! For the time being enjoy this "paradise" of "Big Data" - and did you just switch your light on? 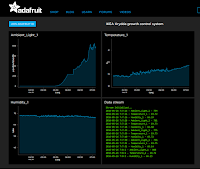 To monitor your cultivation unit from local/ everywhere I wrote a sketch to both send the actual light intensity values via the serial port and to adafruit.io which is a nice web service for displaying data in the internet (of things). 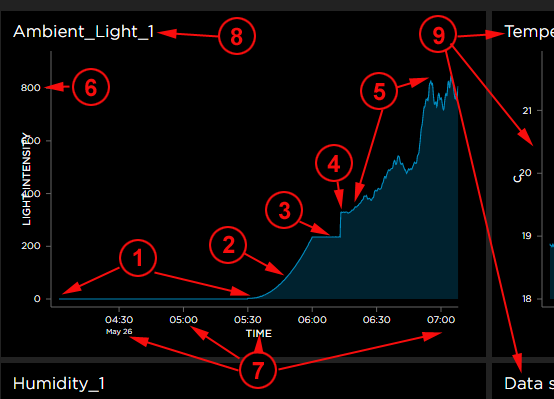 Currently only the light value is displayed and more sensors will be added in the future. You can see the actual values of my Krydda system here. UPDATE 23-5-2016: Added temperature and humidity with the Sensirion SHT21 sensor. 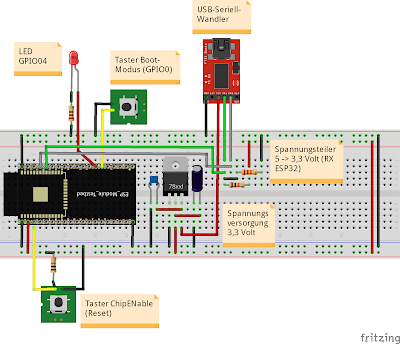 The first sensor for my IKEA hydroponics project is a ambient light sensor (BH1750FVI) which will measure the light intensity on the plant bed in both the seed and cultivation unit. 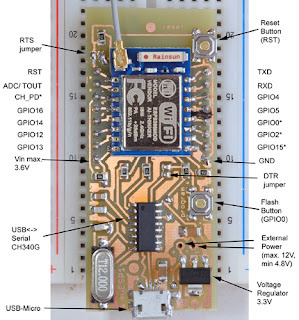 It is currently connected to an ESP8266 - a DIY-friendly and hacker-famous microcontroller with WiFi on board. I wrote a library for the light sensor which works with both Arduinos and ESP8266. You can find it here. The example sketch in the repository currently measures only the actual value of the ambient light. In future versions this sensor will be responsible deciding if and how long the IKEA LEDs have to be switched on depending on the overall light which fell on the plants. There will also be an uplink to a web-service (like Thingspeak or adafruit.io) where all the values are monitored in real time on a nice looking dashboard and will be accessible from everywhere. In the meantime the seeds that germinated changed their habitat to the cultivation unit. 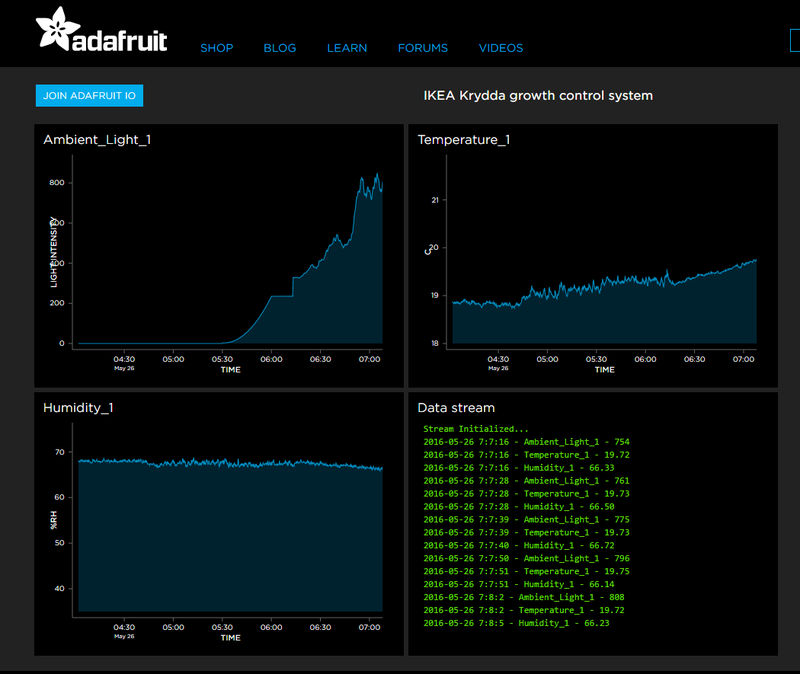 I'm starting a new project with the brand new indoor gardening system from IKEA which is named "Krydda"/ "Växer". 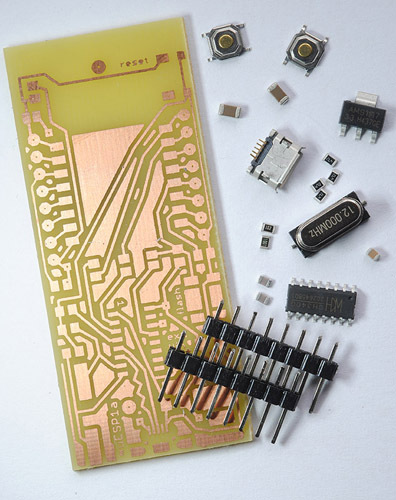 Planned items are to control and optimize growth with a microcontroller/ embedded system and sensors (light, humidity, temperature, CO2, water level etc.) 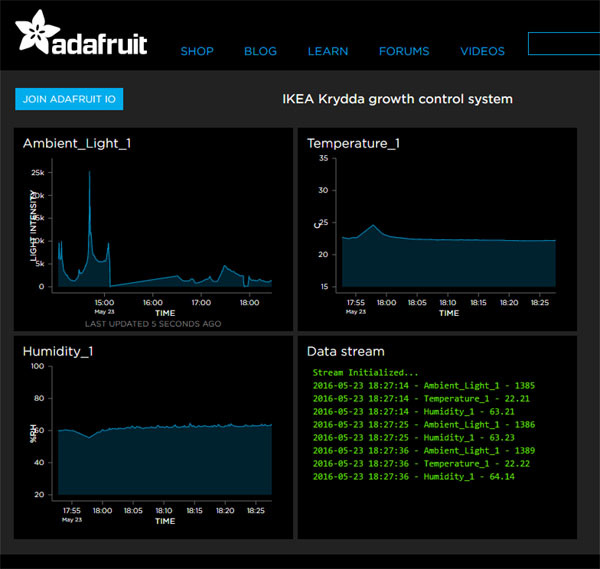 utilizing automated lighting and water refill with the new IKEA Krydda/ Växer system. I designed a single-sided ESP-12/ ESP-07 breadboard adapter PCB which will be easy to etch and solder for anyone who loves to play with the ESP8266 on a breadboard like me. 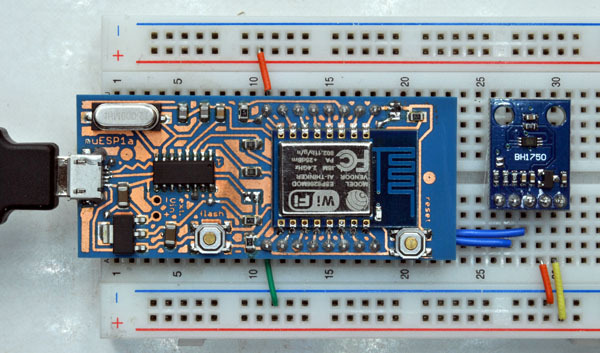 There is also a nice 3D-printed socket from Moritz in his github account to easily program (lots) of ESPs without the need to solder them at all. Remember to put three jumper wires on the bottom side as this is only single sided. See Eagle files for connections.